Out of part boredom and part curiosity (mainly boredom) I started wondering how much teams have changed over the last 5 years. Why 5 years? Well that seems a reasonable amount of time to expect a player to stay at a club. How to measure it? I could have taken the squad as a whole, but players get loaned out quite reguarly, so decided the best way to monitor the changing team line ups would be to take the match day 18 at the same time of the season across the last five years. In this instance, I've tried to take the end of February/start of March as it allows for January signings to settle in. What's it gonna tell us? I started putting the stats together with the prediction that consistency would result in relative success - for example, Wigan wouldn't expect to be winning the league, but staying up each season can be seen as a success, given the resources available. However, I'm writing this before I've analysed the numbers, so we'll see how accurate this hypothesis is. The most obvious check would be to look at the team with the most new players in compared to the team with the least. QPR, with 11 new faces in their squad are currently one of the favourites to go down. Aston Villa with the next highest number of new faces are fighting relegation, as are Norwich (8), Reading (7) and Southampton (7). At the other end of the table, Man Utd who are walking to the title, only had one new player in their matchday squad in their 2-0 win over QPR - Robin van Persie, much to the sorrow of Arsenal fans, and a player with 8 years of Premier League experience. Up next are West Brom with just two new players (Yacob and Lukaku), a club that have surprised many. On four new players are Top Four chasing Arsenal, Liverpool and Manchester City - along with a Wigan team that many tipped for relegation, but who are still in the fight. So it's easy to point to conclude that the fewer new faces, leads to greater consistency - not a massive revelation. There are of course outliers - West Ham as a newly promoted club also had 9 new face, but are performing relatively well in their first season back. Swansea, in the notorious difficult second season, have made 8 changes as Michael Laudrup looked to put his own stamp on the team. And it's worked a treat as they're comfortably in the Top half and have a League Cup trophy for good measure. One of the 8 include Starman Michu, who's scored 17 league goals at the time of writing. So what about longevity? Well it's a similar tale. When looking at the players in the match day squad five seasons ago compared to the same weekend this season, it'll surprise precisely no one that it's the same two teams at either end. Man Utd had a whopping 10 players in their matchday squad against Newcastle five years aga, and that's excluding Paul Scholes. Impressive stuff. QPR on the other hand have just one player left from their game against Barnsley in 2009 - 3rd choice goalkeeper Radek Cerny. Norwich City have just one player from five years ago, which is understandable when you consider that their last five years includes a spell in League One - Irish playmaker Wes Hoolahan. Also on one player from five seasons ago are Sunderland - currently one point above relegation at the time of writing. Behind Man Utd with the most players still active are Chelsea, Everton, Newcastle, Swansea and Arsenal - all with at least 6 players still at the club today. All of which are enjoying decent seasons, with perhaps the exclusion of Newcastle who are currently under pressure. Each team had at least five players from 2011, and Fulham had the lowest with 9 from last season. 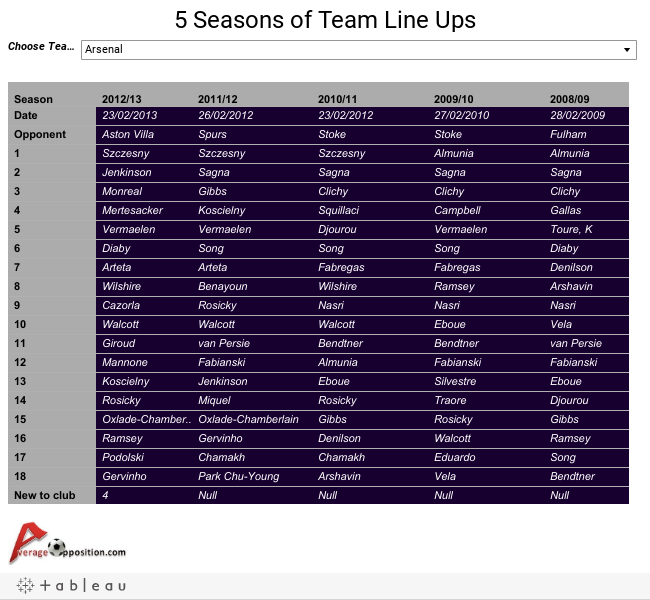 In terms of player consistency, somewhat surprisingly there's only 17 players that have been in the starting line up of the same team over the 5 seasons. It's not a perfect measurement of consistency as players can be injured or rested before Champions League games but it's still an impressive achievement. Less surprising are the names of some of them. Frank Lampard may have been in and out of fashion with different managers, but makes the list despite being in his golden years. As does the not so young American Tim Howard - forging a good career at Everton after not making the grade at Man Utd, which leads neatly onto another player that left Old Trafford for first team football - Ryan "he's not that sort of player" Shawcross. Leighton Baines joins his goalkeeper in the list as do fellow Merseyside heroes Jamie Carragher and Pepe Reina. Perhaps more impressively is the fact that there's several players that have gone through the leagues and are still in the team every season. Swansea's Dyer, Williams and Rangel underline why the club have that unusual quality of an easily identifiable playing style/culture. Southampton's Lallana has the claim to fame of playing across 3 divisions, Reading have Jimmy Kebe and Newcastle have Argentinian pair Sideshow Coloccini and Gutierrez - all having played in the Championship. Making up the list are Schwarzer, Figueroa, Zabaleta and Evra (three more full backs along with Baines and Rangel). Interestingly, there's no strikers in the list. The interactive table below allows you to look at the Match Day squads for each current Premier League Teams going back the last five seasons. And for those of you that ended up on this page whilst searching for David Bowie, I've included 9 of his song titles, but sadly couldn't work in Modern Love, China Girl, or Space Oddity.